Easy to Install and a Needed Upgrade! I was pleasantly surprised with just how easy this upgrade was to accomplish. After I ordered the kit, it arrived in a timely fashion and was VERY well packaged. Install took all of 45 minutes and my car was back up and running. For those who are still using the old SYNC system, this is a worthwhile upgrade. I went without the GPS option (with my cellphone in use, the $600 didn't seem worth it to pay), so I was surprised to see an antenna come with it. Given it's used to sync the system's clock, I suppose it made sense to include. All in all, if you're on the fence, then pull the trigger and get it. Installation is easy, the instructions provided in the box are clear, and the user experience once you're done is MUCH better. Great upgrade to my 2013 Escape SEL. Easy install and works just as advertised. The advertised functionality upgrades are great and the new unit is much faster and smoother. No more lag on each screen touch or voice command. Excellent piece of kit. Whether the move from 2 to 3 is worth the price, well that’s up to you. But the quality of this package is fantastic. Watched the online video and tackled it with no issues. Well, one minor issue. Had to head to the hardware store mid install to get a Torx T8 bit to remove the bracket from the old unit. But other than that detour the instructions were spot on, and the Sync 3 unit powered up and worked flawlessly. Apple CarPlay works great as well. Very happy with the purchase. 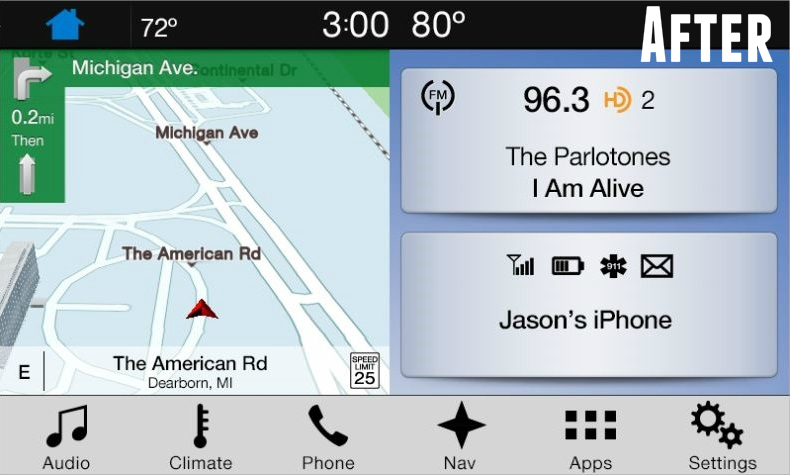 I hated the My Ford Touch and Sync 2. In my Escape. The Navigation was not very easy to use and the MFT display was not the best. I’m a big Apple user and wanted CarPlay and Sync 3 but did not want to have to purchase a new car to get it. Ford will not upgrade it. My Escape is in perfect condition with low millage. I just needed this upgrade. Super fast shipping and received in 2 days. Super easy to install in under 30 minutes and everything works great. It’s like driving a brand new car. I love it! I love everything about my 2013 escape EXCEPT for the crappy Ford My Touch system. It was so bad I was seriously thinking about getting a different car or trying to cluge together an alternative radio . Ford really left the My Touch owners out to dry when they parted from Microsoft and stopped supporting the countless cars on the road with My Touch. I was excited to find the Sync 3 upgrade from 4Dtech. Installation was easy and the results are Great! So far no more lockups, bluetooth connects very quickly and having CarPlay is awesome! The only reason I did not give it 5 starts is it is quite pricey. I couldn't be happier with how easy the upgrade from sync 2 to sync 3 went on my 2015 ford escape. Not having the ability to use carplay or android auto was the one disappointing part of my vehicle purchase. With this upgrade kit I now have everything I was looking for in the first place. I would definitely buy from 4Dtech again and have already recommended this upgrade to a few friends. An Easy Upgrade, and Worth It! I decided to upgrade my 2014 Ford Escape to Sync 3 because the Sync 2 system was starting to get buggy with my iPhone 7. (It would only skip to the next song after several pushes of the FF button; the album art would remain 2-3 songs behind, etc.) In short, it was always a gamble if the Sync would work or not. And even though the upgrade is a bit pricey, it has proven to be worth it. The kit from 4DTech had everything I need. I decided to buy the trim removal tools as well. The included instructions were fine, but I would recommend watching Dan Kuehling's video "Ford Escape - SYNC 3 Upgrade Installation" on YouTube. 4DTech also has several installation videos that are helpful. One thing you will need to purchase if you don't already have one: a Torx T8 size screw driver. You need this to remove the metal brackets from the old unit--you will reuse them on the new unit. The included instructions list the T8 Torx as required, but the website listing does not. Fortunately I have a set. Overall, the install was shockingly easy and took about 30 minutes. The trim removal tools were helpful but not necessary. The new screen is a higher resolution, and is very responsive. All of the Ford's previous features are retained and work as before. Magically, it remembered my presets for the FM radio. The default Sync 3 interface looks great, a big improvement over Sync 2. It also switches from light mode to dark mode when the outside light is darker, and back. The Apple CarPlay system works perfectly. It instantly recognizes when my iPhone is connected and will begin playing the last song/podcast/book played. The Apple maps system works well. 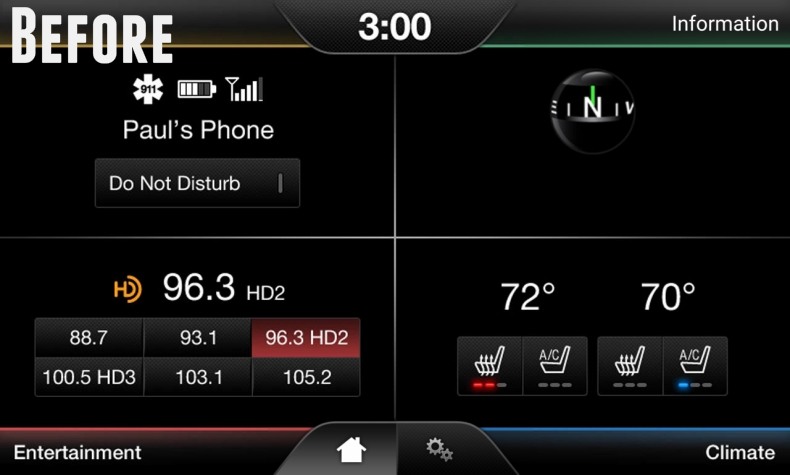 Tip: To adjust the spoken navigation voice, wait until it says something, then turn up/down the volume. A new onscreen display will say "Prompt Volume" as opposed to the normal "Music Volume". Moving back and forth between CarPlay and the default Sync 3 screen is instant. If you are in the Sync 3 screen, and the phone rings or you receive a text, it will instantly switch to CarPlay, which is nice. To conclude: Easy install, great product. If you're thinking about upgrading, and you plan on having your car for a long time, it's a worthwhile investment.